NASA's Lunar Atmosphere and Dust Environment Explorer (LADEE) mission has turned up evidence that meteor showers help create the moon's wispy atmosphere. Here, an artist's concept of the LADEE spacecraft in orbit above the moon. Meteoroid showers help create the moon's exosphere, its wispy version of an atmosphere, a new study suggests. The moon's atmosphere consists entirely of a tenuous layer called an exosphere, where the density of gases is only about one-trillionth that of Earth's atmosphere at sea level, according to the authors of the new study. The molecules are so thinly spread apart that they almost never hit one another. Earth also has an exosphere, but it begins about 300 miles (500 kilometers) above the planet's surface, while the moon's exosphere starts at its surface. To learn more about how the moon's exosphere interacts with its surface, researchers focused on sodium and potassium. These elements are only trace ingredients of the lunar exosphere, but they emit enough light to make them the easiest of the exosphere's constituents to detect with scientific instruments. Previous data on sodium and potassium in the moon's exosphere was sporadic and limited, the study authors said. By analyzing new data from the Lunar Atmosphere and Dust Environment Explorer (LADEE) mission, the scientists were able to consistently monitor changes in the lunar exosphere's sodium and potassium levels over the course of several months. The scientists found that after meteoroids rained down on the moon, lunar exospheric levels of sodium and potassium spiked. "The Geminids meteoroid shower resulted in a striking 200 percent increase in the levels of potassium, and a more diluted increase in the sodium levels," Colaprete said. The scientists found that it took a while for sodium and potassium levels to return to their previous extents after meteoroid showers. This finding suggests that exosphere particles can accumulate on the moon's surface only to slowly get released over time, unlike simpler previous models that proposed that exosphere particles either bounced off the lunar surface or stuck to it, Colaprete said. Furthermore, while it took days for potassium levels in the exosphere to recover after meteoroid showers, it took sodium about three months to do so. "Different gases will interact with the soil in different ways," Colaprete said. "Once in contact, electrical forces can cause them to stick. The strength of these sticking bonds is dependent on the element sticking and the soil composition and characteristics, such as grain sizes." The rate at which sodium and potassium were released from the lunar surface also varied depending on the levels of rare earth elements and potassium on the lunar surface. This finding suggests that the composition of the soil may also play a role in the nature of the lunar exosphere. 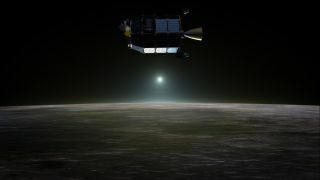 In addition, the researchers found that lunar exospheric levels of sodium increased when the moon was sunlit and decreased when the moon was not lit by the sun. Colaprete suggested that solar ultraviolet light was enough to break some of the bonds between exosphere particles and the lunar surface. Other bonds required a blast from solar particles, such as protons or high-energy helium nuclei known as alpha particles, or even meteoroid impacts. "This is akin to billiard balls kicking out the elements from the soils," Colaprete said. The scientists detailed their findings Dec. 17 at the American Geophysical Union's fall meeting in San Francisco and online Dec. 17 in the journal Science. Follow Charles Q. Choi on Twitter @cqchoi. .Follow us @Spacedotcom, Facebook and Google+. Original article on Space.com.